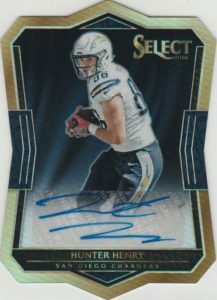 Comprised of vivid designs and lots of Prizm parallels, the 2016 Panini Select Football checklist skews heavily to the ’16 rookies and even looks further ahead in the 2017 NFL Draft. Each hobby box contains three hits with two being autographs. 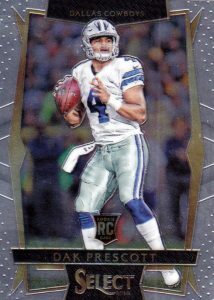 Following a one-year break, 2016 Panini Select Football returns to the NFL hobby with a new base format. Broken into three tiered subsets, the base set totals 300 cards via Concourse Level, Premier Level die-cuts and Field Level versions with increasing rarity. 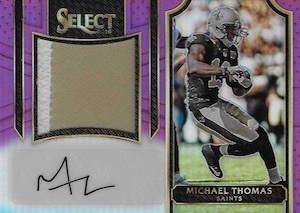 Parallels include Tie-Dye Prizm #/25, Gold Prizm (#/10) and Black Prizm (1/1). Highlighting the stars of the 2016 rookie class, auto-relic inserts, numbered to 99 or less, include Jumbo Rookie Signature Swatches and Rookie Autographed Materials. 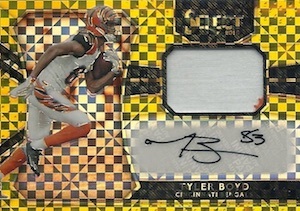 In addition, both offer limited Copper, Purple, Orange, Tie-Dye, Gold and Black Prizm parallels. 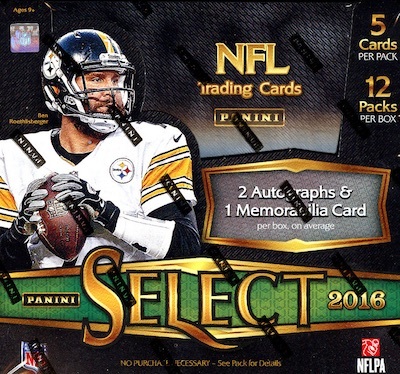 While the first-year players maintain considerable attention, 2016 Panini Select Football also provides veteran and retired player content, to the tune of more than 50 subjects, in other autographed relic inserts. Averaging one per box, memorabilia cards include Jumbo Rookie Swatches, Prime Selections and Select Nameplates. 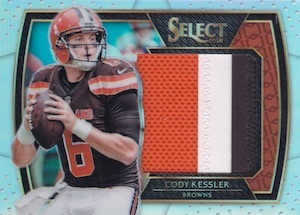 Again, parallels ramp up the rarity and quality with Brand Logo, Nike Laundry Tag and NFL Shield versions. 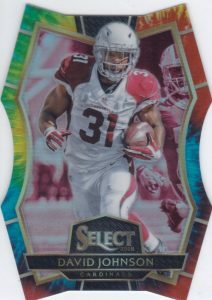 Lastly, 2016 Panini Select Football is not just confined to one year. 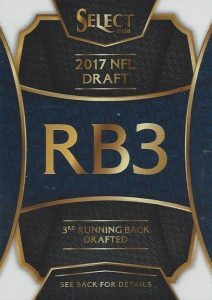 Intriguing for collectors already anticipating the ’17 season, XRC inserts average one per box and document the 2017 NFL Draft class. PARALLEL CARDS: Prizm, Tri-Color Prizm, Blue Prizm #/149, Red Prizm #/99, Orange Prizm #/49, Tie-Dye Prizms #/25, Gold Prizm #/10, Green Prizm #/5, Black Prizm 1/1. PARALLEL CARDS: Prizm, Tri-Color Prizm. PRIZMS DIE-CUT PARALLEL CARDS: Light Blue #/125, Purple #/75, Tie-Dye #/25, Gold #/10, Green #/5, Black 1/1. PARALLEL CARDS: Prizm, Tri-Color Prizm, Copper Prizm #/49, Tie-Dye Prizm #/25, Gold Prizm #/10, Green Prizm #/5, Black Prizm 1/1. 25 cards. 1 per box. Full checklist will be added if provided. Shop XRC on eBay. Card subject is based on draft spot by position. For instance, RB3 = third running back taken. PARALLEL CARDS: Tie-Dye Prizm, Gold Prizm, Black Prizm. PARALLEL CARDS: Copper Prizm #/35 or less, Tie-Dye Prizm #/25 or #/15, Gold Prizm #/10 or #/5, Black Prizm 1/1. PARALLEL CARDS: Tie-Dye Prizm #/25, Gold Prizm #/10, Black Prizm 1/1. PARALLEL CARDS: Copper #/25, Tie-Dye Prizm #/15 (*Roger Craig #/10), Gold Prizm #/10 or less, Black Prizm 1/1. PARALLEL CARDS: Copper Prizm #/49 or #/35, Tie-Dye Prizm #/25, Gold Prizm #/10, Black Prizm 1/1. PARALLEL CARDS: Wave Prizms #/10 or less, Power Prizms 1/1. All subjects not included in Wave parallel. View specific options with the full spreadsheet. PARALLEL CARDS: Wave Prizms #/10, Power Prizms 1/1. PARALLEL CARDS: Gold Prizm Team Logo #/10, Black Prizm Brand Logo 1/1, Black Prizm Laundry Nike 1/1, Black Prizm NFL Shield 1/1. PARALLEL CARDS: Gold Prizm #/10, Black NFL Shield 1/1, Black Prizm Brand Logo 1/1, Black Prizm Tag 1/1. PARALLEL CARDS: Purple Prizm #/60 or less, Orange Prizm #/49 or less, Tie-Dye Prizm #/25, Gold Prizm #/10, Black Prizm 1/1. PARALLEL CARDS: Purple Prizm #/60, Orange Prizm #/49, Tie-Dye Prizm #/25, Gold Prizm #/10, Black Prizm 1/1. All subjects not included in Purple/Orange parallels. View specific options with the full spreadsheet. PARALLEL CARDS: Gold Prizm #/10, Black Prizm Laundry NFLP’s Logo 1/1, Black Prizm Laundry NFL Shield 1/1, Black Prizm Laundry Nike Swoosh 1/1. No word on Complete FB. The 16-17 Complete basketball version was barely even mentioned by Panini when it came out. Oh ok thanks. Was told a while back that they would be doing a comprehensive set, was just wondering about it. Loved this set back in 2014, but will they bring back the one-per-case hot boxes? Definitely excited to snag a box but $120 is a little high. Worth it if you love the set like I do. Picked up a hobby box of these and only 1 autograph I guess sending them an email won’t do any good. Any suggestions? 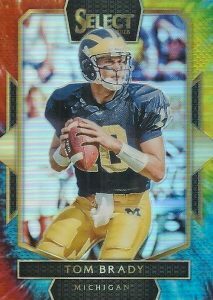 Your best bet is to contact Panini support about your missing autograph. 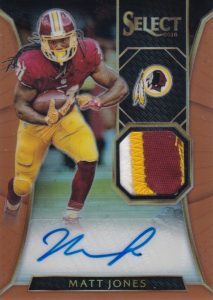 http://www.paniniamerica.net/faq.cfm There is a section for Missing Advertised Content. Thanks for the info I like what I got but I still want my auto. I got 4 cards #under 149 and my auto is goff nameplate 4/49 so not so bad. 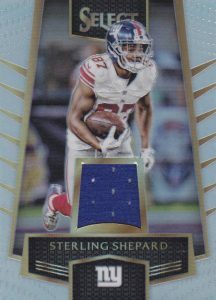 Interesting product busted one box that had two Braxton Miller autos and one color patch of Jared Goff. Did two packs and hit Connor Cook auto patch # 5/10 So I did another box at a different local. Same weird deal two Kenyon Drake autos BUT! 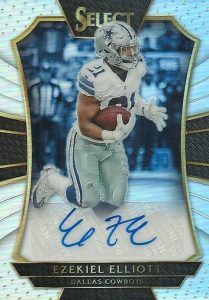 The Jersey card was the 1/1 Ezekiel Elliott Nike Swoosh ! Fun break. Would have given this five stars if there was not dupe autos in the boxes. I buy select in all sports. does anyone know about the nfl redemption draft picks. what is the highest number by position ? my highest is five. are there only four types of positions ? Some incredible pulls from my 16 boxes including a Dak Prescott Tie Dye Rookie Materials Auto /25 and a Marcus Allen Laundry Tag Auto Black 1/1, which I cannot find on the checklist! Listed immediately on eBay. Allen is part of the Autographed Materials Prizm insert. Two completely terrible hits in a Justin Forsett base auto (Lions, wut?) and a base Arian Foster jersey swatch, but my third hit made up for it. 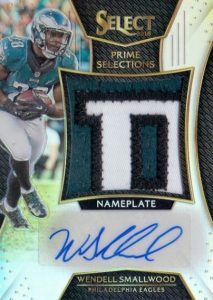 A 1/1 Carson Wentz NFL Shield Auto. Amazing. Still have yet to see a truly bad box of this stuff. Probably my favorite 2016 product, even if it came out in 2017. Great product that just looks sharp! Expensive but hopeful that it will pay off down the road with some big hits!